It's the week leading up to Easter ... what better time to post the Easter cards I've made for family? First up, let me show you the card I've made for my parents, who live in Naples, Florida. This card is "tastefully elegant", much like the two who have loved for going on 63 years! 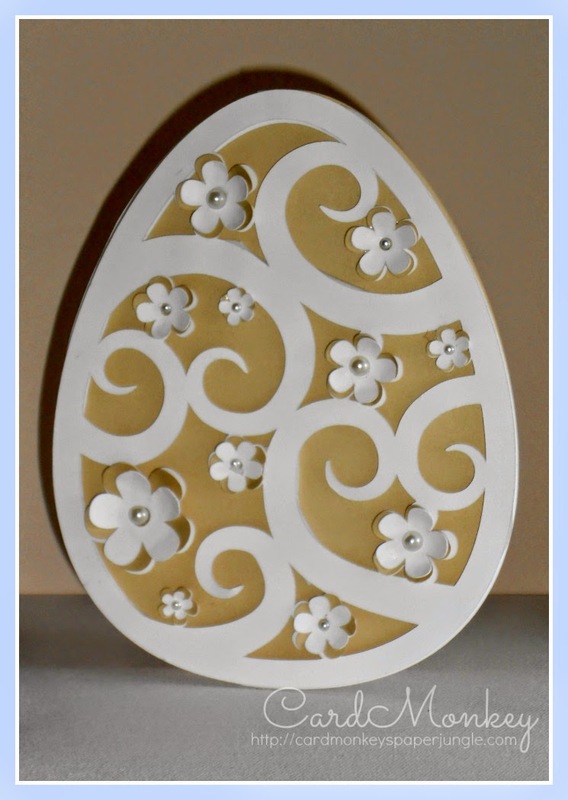 To make this egg-shaped card, I used a file from the Silhouette Online Store, and modified it just slightly. I cut it on my Silhouette Cameo, including extra of the flowers (using Close To My Heart's White Daisy and Bamboo cardstocks) to layer atop of the flowers in the design. To give the flowers extra dimension, I burnished the cut flowers so the paper softens and curls as I rubbed. I adhered them with glue and topped each with a pearl. I popped up the entire top cut layer, using foam tape.